The Export Expansion Grant is a federal government initiative aimed at encouraging exporters especially those that add value to their products. The grant ranges from 5-30% of the FOB value of the item exported, depending on the degree of processing the item went through in Nigeria before exportation. The EEG Scheme is processed in Nigeria Export Promoting Council (NEPC) and administered in conjunction with the Implementation Committee inaugurated by the government. The EEG is issued in form of a Negotiable Duty Credit Certificate (NDCC). This is sold as a Discounted instrument to Importer who then use it to pay their import duties. (6) Special Adviser to the President (Manufacturers and Private Sector.). The success of this blog and the numerous enquiries that we get everyday on how to explore the opportunities in the export business in Nigeria and do it right from the onset, all point us to the need for export education among the Nigerian enterpreneurs. 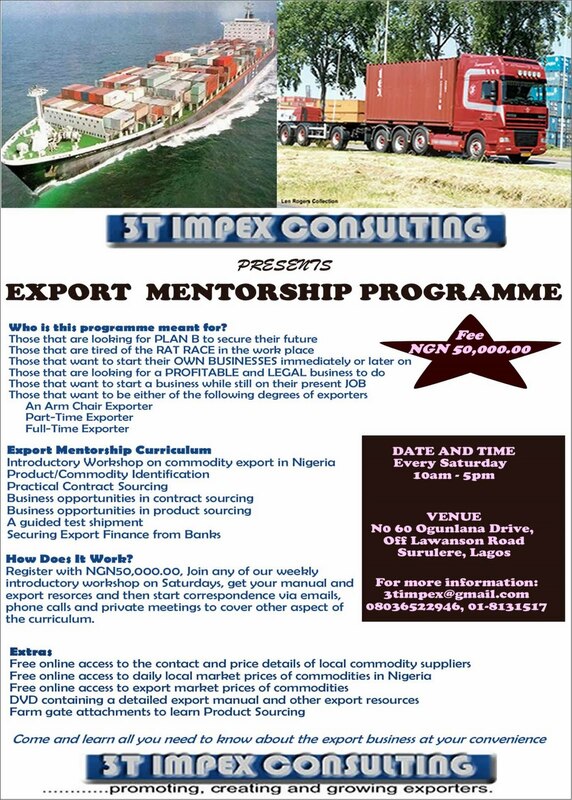 In other to be able to provide a lasting solution to this knowledge gap in the export business, the 3T IMPEX CONSULTING has put together a curriculum to start the first Nigerian Export Mentorship Programme. This mentorship programme is different from one of those regular export trainings that people pay a fortune to attend for just two days after which you are either now on your own or you probably still always need to depend on the "consultant" to do almost everything for you. 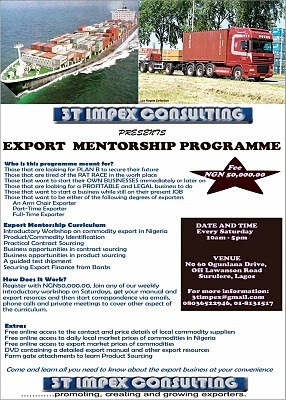 Apart from the fact that this mentorship programme is very cheap, it is organised by an experienced exporter, who is also an international trade finance specialist with numerous certifications(CDCS, ISP MASTER, ITS). In addition to this, the mentorship programme will teach you "how to catch the fish" by yourself by hand holding you from the very beginning to the end of your first sets of transactions. We will pratically take you through the export process and also show you all other avenues for making money apart from the export proceeds from the exported commodities. 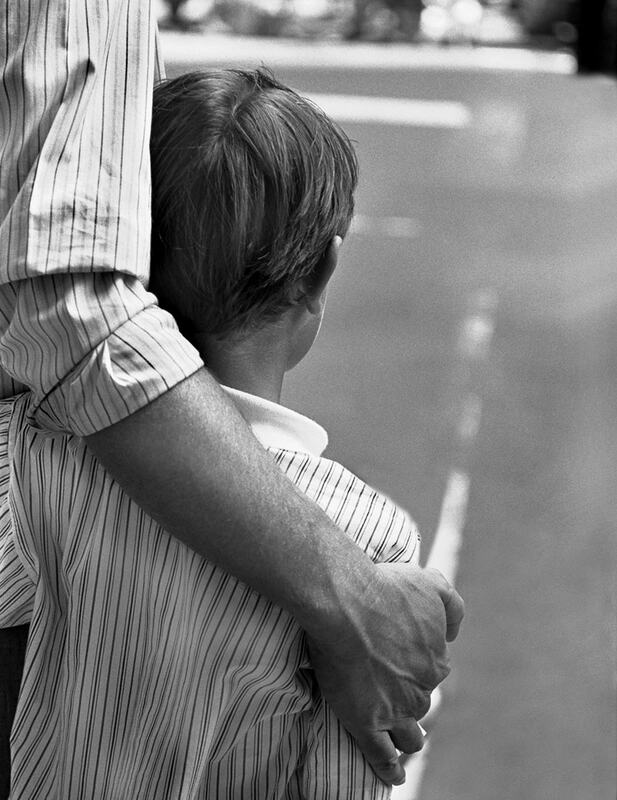 We will also give you a very comprehensive manual and you will have access to daily local commodity prices and numerous local commodity suppliers. Why not join us today by enrolling for the export first ever Nigerian Export Mentorship Programme.